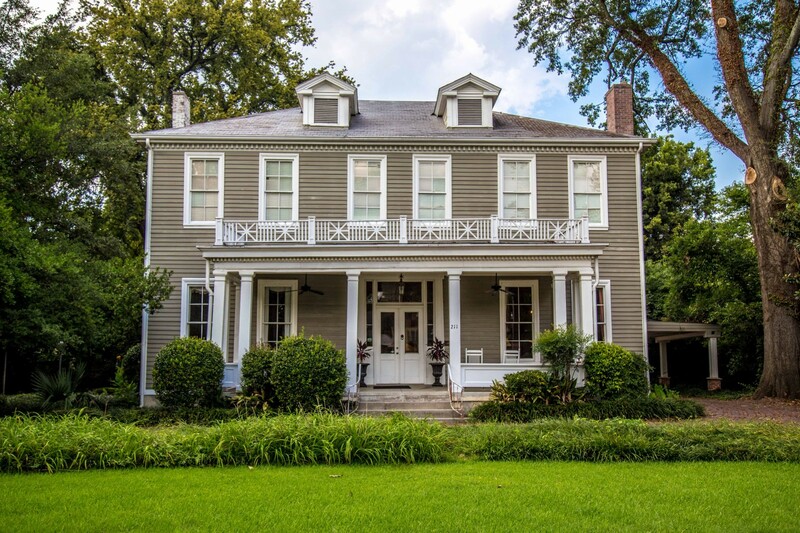 Originally constructed in 1859 by Clarksdale founder John Clark, The Clark House was the first home built in Clarksdale, and is listed on the National Register of Historic Places. The home is situated on two acres adjacent to the Little Sunflower River, and has just been extensively refurbished and beautifully redecorated as a residential inn. All rooms have private baths. Each room has a flat screen TV, a desk, and comfortable seating. Our rooms do not have phones, but Wireless Internet service is available without cost. Big Daddy, Stella!, Desire and Baby Doll are located upstairs in the main house, and share a common lounge area at the top of the stairs. Crossroads is located on the ground floor of the main house. Bottletree, King Cotton and Magnolia are located in a separate cottage adjacent to the main house. All of our guests are welcome in the common areas of the main house, which include a living room/parlor, a library and the dining room. A refrigerator is available in the kitchen for your beverages and snacks. Located upstairs in the main house with a large private bath that includes a tub/shower. Our largest room features a fireplace (non-operating), a comfortable sofa, overstuffed chair, flat screen TV, a writing desk, and a luxurious Serta Vera Wang king size sleigh bed. A separate lounge area is located at the top of the stairs for our upstairs guests. Located upstairs in the main house, with a large private bath that includes both a stall shower and clawfoot tub. This is a large room that is private, and located away from other rooms, and features two overstuffed chairs, flat screen TV, writing desk, and a luxurious Serta Vera Wang queen size bed. A separate lounge area is located at the top of the stairs for our upstairs guests. Located upstairs in the main house, with a private bath that includes a stall shower. This room features a fireplace (non-operating), two overstuffed chairs, an ottoman, flat screen TV, writing desk, and a luxurious Serta Vera Wang queen size bed. A separate lounge area is located at the top of the stairs for our upstairs guests. Located upstairs in the main house, with a private bath that includes a stall shower. This room features an overstuffed loveseat, flat screen TV, writing desk, and a luxurious Serta Vera Wang queen size bed. A separate lounge area is located at the top of the stairs for our upstairs guests. Located downstairs in the main house, with a large private bath that includes tub/shower. This room features an overstuffed chair and ottoman, flat screen TV, writing desk, and a luxurious Serta Vera Wang queen size. Located in the cottage, with a private bath that includes tub/shower. This room has a small porch, and features an overstuffed chair and ottoman, flat screen TV, writing desk, and a luxurious Serta Vera Wang queen size bed. Located in the cottage, with private bath that includes tub/shower. This room has a corner porch overlooking the rear yard, and features a fireplace (non-operating), an overstuffed chair and loveseat, flat screen TV, writing desk, and a luxurious Serta Vera Wang queen size bed. Located in the cottage, with private bath that includes tub/shower.This room has a private porch overlooking the rear yard, and features two overstuffed chairs, flat screen TV, writing desk, and a luxurious Serta Vera Wang queen size bed.